Finally, a Solution to Heel Pain? Throughout the world there are young soccer players ages 8 – 14 dealing with heel pain every time they take to the field. After many years of dealing with this problem and conducting research I have finally found a “cure”. Now, while CURE is probably the wrong word to use, if you fix a problem, I would call that close enough to a cure even though it is a “fix”. Remember, the heel pain referred to as Severs Disease is from a normal growth process. The only real “cure” is time and finishing or at least getting through the growth stage. All the physicians and specialists will tell you the same thing, “All you can do is help them get through it, avoid the activity, stretch and ice.” It is very common and one of those frustrating “growth issues”. In a way this whole process has several funny twists to it. I work with soccer players at all levels of the game from young 9 year olds to professional players. While developing the SoccerU. series I dealt with a large number of players in the 10 – 14 year old age group. Several had this problem. However, nothing touches home like having your own son having horrible pain that is so unbearable he has to pull out of games. This started my journey of research, trials and experiments. I can tell you now that changing cleats, stretching, icing and all the recommend treatments might help a little, but they DO NOT stop the pain. I have a closet full of “fixes” that will soon be thrown away. 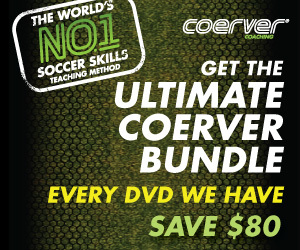 Don’t forget to watch the preview of the new SoccerU Technical Series. Many, many years ago (before cell phones but after dinosaurs) I was getting ready to move and took a temporary job at a small new company. This company had figured out that a special type of foam material was better at deadening impact than others on the market. Its structural make up, an open cell vs. a closed cell membrane, allowed for amazing results. At that time it was a whole in the wall with around 7 employees. When the salesmen, all 2 of them, traveled to trade shows they would take a self made contraption that looked like a long tube. An insole would be placed at the bottom and from 6 feet up and egg would be dropped down the tube. The insole would absorb the impact and the egg didn’t break. After having this “flash back” I did some searching and found the company was still around and was now quite large and successful. (I’m sure greatly due to my six months of work.) I found a pair of their insoles and took them to my “evil laboratory” (garage) to begin my work. The first problem I had to overcome was the width. Soccer cleat insoles are very narrow. My son was wearing a men’s size 8 at the time but a men’s insole would not even come close. So I bought a women’s size and it was much closer. I removed the soccer cleat insole, traced it, and put the new insole in the cleat. All seemed great until he tried them on. When he put them on he immediately commented that his “toe area” felt too tight. After comparing the replacement with the normal insert I realized that the “height” of the toe and ball of the foot area was too thick compared to the insole that came with the cleat. Now, if I had a belt sander it would have been much easier. (My wife prefers that I don’t handle sharp objects or power tools.) Instead I sat in my driveway slowly rubbing the front area of the insole back and forth on the cement. This “sanded” or removed some of the material. I kept working it for quite some time until I removed about half of all the front end foam. Problem solved. While this method seems tedious, it does allow for great control over the removal process. After nearly 2 seasons with my own son using this method and many others that have tried it, it has proven to be the only effective method for “curing” 90% of the pain. These are the first known results that have effectively proven to eliminate the pain almost immediately and long term. Make sure you buy cleats that have a PULL OUT insert and not one that is glued in. Click the picture to see the insoles.